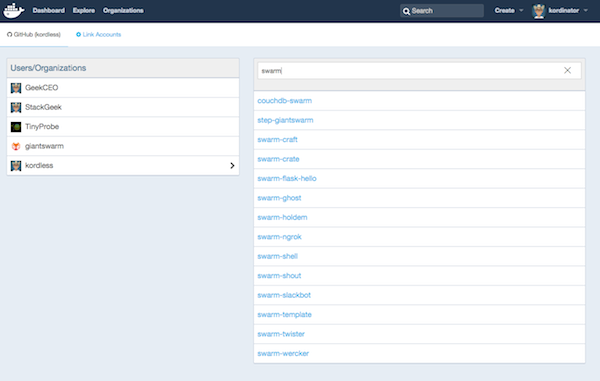 Swarm Inception is a simple application which implements continuous deployments using Docker Hub’s builder service. Builds are conducted via Github webhooks and when the build completes, Docker Hub will call this service’s webhook handler, which in turn triggers a deployment or update of the image built by Dockerhub onto Giant Swarm’s public cloud. While Inception uses Giant Swarm’s APIs to implement CD onto our shared cluster, it could easily be repurposed to implement CD with other stacks and/or services. This project should take you about 10 minutes to run through. We’ll start by forking the sample repo, setting up a Docker Hub account and then configuring it to build the repo. docker build -t registry.giantswarm.io/bant/inception . 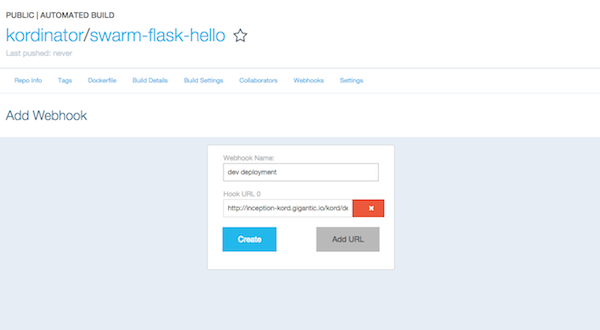 Use http://inception-bant.gigantic.io/bant/dev/hook on Docker Hub's hook to deploy a service. 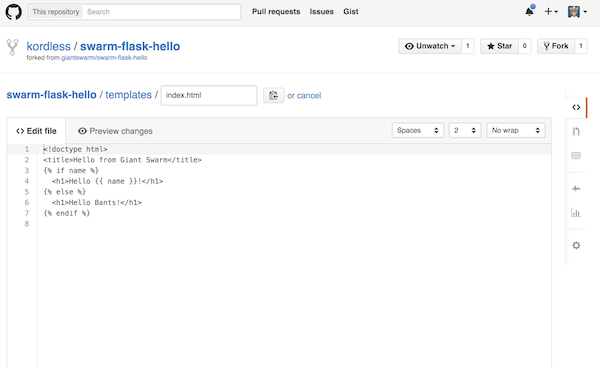 Next, head over to the swarm-flask-hello repo and fork it into your Github account. Make sure you leave the repository public! There are detailed instructions on the repository’s README.md file you may follow. The basics are covered here for review, and require you have cloned your own fork of the repo locally. Create an account on Docker Hub if you don’t have one, and then login. 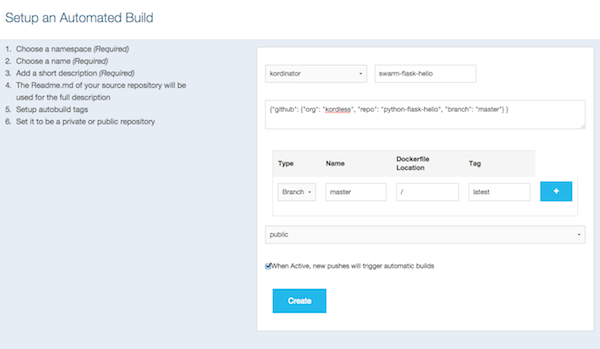 Click on the Create pulldown on the top left of Docker Hub and then click on Create Automated Build. If you haven’t linked a Github account yet, you will need to do so before continuing with this step. Ensure you give Docker Hub read and write access to your Github account. Once you’ve added an account, you’ll be shown a list of organizations and repos. As shown in the screenshot, you will need to add a snippet of JSON to the “short description” for the build repo. The reason for this is because Docker Hub won’t pass on the Github repository information in the POST hook call we’re going to set up in a few minutes. Substitute your Github username for bant in the example above and then click on the “Create” button at the bottom of the page to create the new Docker Hub repository build. Change the <username>, <org> and <env> entries above to whatever was output by the launch of the Inception service above. Name the webhook something like dev deployment and then click on “Add URL” to finish adding the webhook URL. When you are done editing the file, click on the “Commit changes” button at the bottom. Docker Hub will start building your image within 10 minutes or so. When it is done, it will call the swarm-inception service you started in the previous section, or update it if it was already running. Keep in mind if you do subsequent commits to your directory, Docker will do a build of the image and then call an update on your Giant Swarm service!